Well, we're pretty healthy people here at Qmania, but that doesn't mean we can't enjoy some sirloin goodness every now and then, right? In burger form is a big plus when we're in a hurry. With a discount is a big plus all the time. 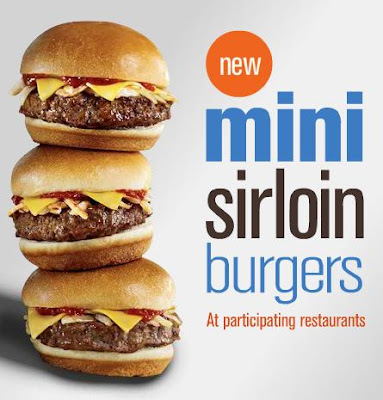 Right now, Jack in the Box is highlighting their new Sirloin Minis with a $1 off coupon. That's right. Get $1 off Mini Sirloin Burgers from Jack in the Box. That's combo or a la carte. Good deal! The deal is up until May 20 and is good throughout most of the United States. Get yours now by clicking here. Right now you'll have to be near a printer to get the deal. Sirloin. $1 off. Yum. Enjoy.